The Volunteer Park Conservatory was (and still is) the perfect Holiday backdrop with all its lush greenery and Christmas-themed decor. And indeed this Valentina & Valentia 100% silk chiffon dress imbued me with feelings of a (pregnant) yuletide fairy. "The whisper of the wind in the mountains and the sound of the sea at sunset; long road in the moonlit night and the starry sky in August; a classical music concert in the ancient theater and art exhibition in some small Paris museum; the smell of jasmine in the garden and the aroma of strong espresso in a Roman café … every moment in life gives inspiration. Just look around to realize that miracles happen every moment – and nothing else happens. Valentina & Valentia. Valentina & Valentia – a young brand created by three bright women. Valentina, Heli, and Milena – three generations of a wonderful family. Strong and successful, these women know how to be a lady in a tough man’s world. The clothes they create express their essence and philosophy of life. The main thing in life – that’s the beauty – they say – beauty in the broadest sense of the word. It starts with beautiful thoughts and good intentions, and continues in the way we live, what we surround ourselves with and how we look. That is why in the first place Valentina, Heli and Milena want to surround you with beauty and harmony. And what can be more harmonious and natural to women than flying skirts and delicate dresses? The dress, not trousers, opens in women the most pristine energy that turns us into goddesses. Valentina & Valentia woman – soft and gentle, and at the same time she is strong and resolute. She knows what she wants and achieves her goals – softly, almost playfully wrapping each step in ease and feminine charm. It is enough to leave the house in the flying silks from Valentina & Valentia, to feel: a measured charm and sensual energy – the main weapon of the modern woman. Fashion images from Valentina & Valentia are original and organic, their femininity is a force, and their modern sensibility – with a bit of nostalgia, is like a drop of French perfume on woman's wrist." Actress Kelli Berglund Wears Valentina & Valentia In editorial for SpyNews Magazine in Los Angeles. Kelli is wearing Valentina & Valentia silk chiffon dress (on the left) and wool crepe dress with silk chiffon sleeves (on the right). FW 17/18 collection. German top model Gigi Thoennes is wearing Valentina & Valentia in Santa Monica. Gigi is wearing silk lined wool crepe suit adorned with feathers from FW17/18 collection, poetically called 'The Rear Bird'. Perfect balance between effortless glamour and Hollywood chic. "Nothing says elegance and femininity like Valentina and Valentia. 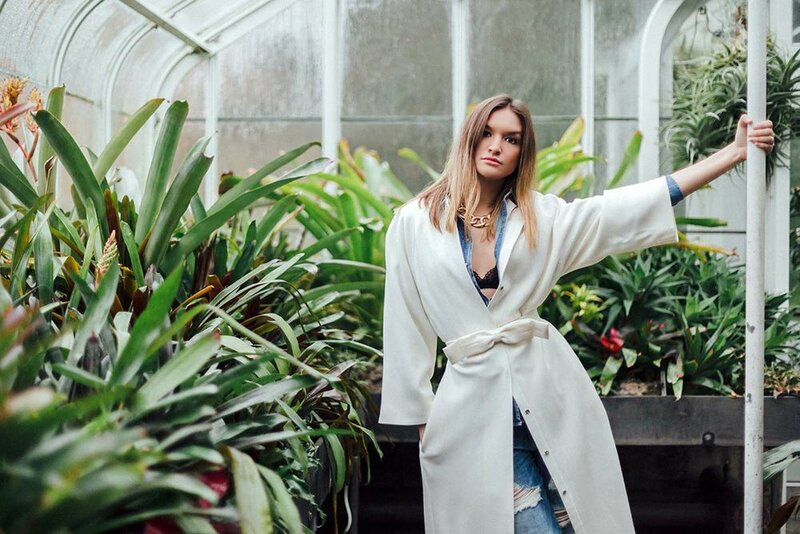 The Seattle fashion designer who recently won “Fan Favorite” at Bellevue Fashion Week, is known for her ethereal silk, cozy cashmere and top quality wool. While a good portion of my life consists of running out of clean coffee mugs and ironing my shirt pockets with a straightener (seriously it works), I’m a sucker for moments when I can look elegant and feminine. And when is a better time to be elegant, dressed in pure silk, than Christmas? This red blouse and skirt comes from Valentina and Valentia’s White Orchid Autumn/Winter 2016/2017 collection. The design is truly stunning from the overall structure down to the tiniest embroidered gold stars. And it feels amazing! It’s lightweight and has natural movement, twirl, and bounce. I love that Milena and her brand stand for women who are more than beautiful or even successful, but embody hard work, independence, and adventure. My greatest passion for Valentina and Valentia (and fashion in general) is the ability for an outfit to transform how a person feels about themselves, the decisions they make, and how they approach life. I put on this outfit, blinked my eyes, and suddenly the image of me wearing mismatched socks and overeating Costco pot stickers became distant. I looked like someone who could deliver a powerful speech, write a book, or walk a runway. Fashion gives you the power to see the best version of yourself, realize your potential, and take action. Valentina and Valentia does just that." "Here wearing the most gorgeous, hand embroidered, silk jacket, designed by local designer, Milena of Valentina & Valentia. I had the pleasure to talk over tea with her, in her beautiful home, about everything from her design inspiration to the selection process of the pure silks that make up all of her designs. The detail of this embroidered crepe jacket expounds a vast amount of passion, one thing that Milena has definitely poured into her brand. I feel empowered wearing a piece that I know is created with such care and completely embodies luxury. These images are only some of the first to come with Valentina & Valentia and I cannot wait to share the rest of them with you, including a special editorial shoot that I am dying to share." "Back in one of my favorite local designers, Valentina & Valentia, wearing their long white vest." I recently discovered Valentina & Valentia (V&V), a brand that specializes in luxury garments for women that value elegance, timelessness and luxury. V&V is known for crafting with ethereal silk, cashmere and the finest wool. Their craftsmanship is of the highest quality, and fabrics are imported from the best mills in France, Italy and England. I wore their “gold rush” coat that creates clean lines, made of high quality Italian wool crepe and has a pure silk lining. A multi-layered belt that comes with it adds an elegant touch. Of course, as a tomboy at heart who values everyday comfort, I paired it with distressed boyfriend jeans (similar ones by BooHoo), and a denim shirt. This look is proof positive that luxurious chic items can impart a great impression when paired well with street-style garments. I topped off my look with Valentino shoes (also in coral/avocado and red patent leather), a lace bralette from Aritzia (similar on Nasty Gals) and a gold chain (similar by Cole Haan). Get inspired and check out the full collection from Valentina & Valentia here.